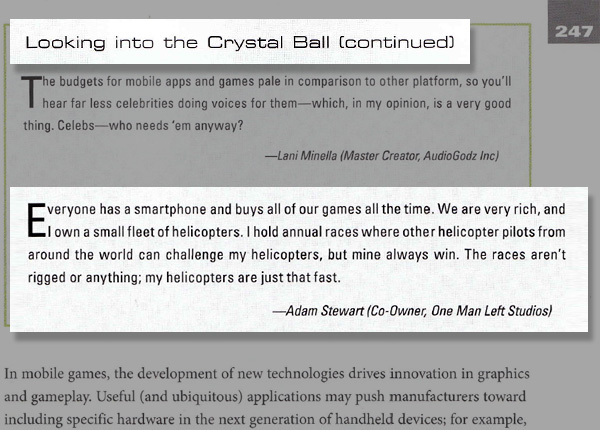 The following is an actual excerpt from a textbook called Game Development Essentials: Mobile Game Development. I was asked about my vision for the future of mobile gaming, a topic I think about pretty much every day. @dizzy: Sorry, no plans for Android at the moment. We just don’t have the manpower to redo everything. Nice job Adam!! Check that off the bucket list. Nice future, sounds pretty awesome. lol i wish i had a few helicopters of my own. Adam Stewart like a boss.